There are two notable portraits of Sir Henry Mainwaring (1726-1797), the fourth baronet of Over Peover. Unfortunately these portraits are sometimes thought, mistakenly, to be portraits of Sir Henry Mainwaring (1587-1653) the pirate. I wrote about the pirate in an earlier blog post. The two men were related, as third cousins four times removed. Their common ancestor was John Mainwaring (1470-1515), of Over Peover, Cheshire, sheriff of Flintshire, knighted at at the taking of Thérouanne and Tournai. John Mainwaring is my thirteenth great grandfather. There is a cartoon image of Henry Mainwaring, the pirate, in Disneyland at Anaheim in California in the area where people wait for the Pirates of the Caribbean ride. Henry Mainwaring the fourth baronet was the nephew of the third baronet, Sir Thomas Mainwaring (1681-1726). Sir Thomas died leaving no children. His brother Henry (1686-1726) had married Diana Blackett (1703-1737) on 26 July 1725. They had one son, Henry, born on 7 November 1726, after his father’s death on 1 July 1726. This child inherited the baronetcy from his uncle who had died on 21 September 1726. 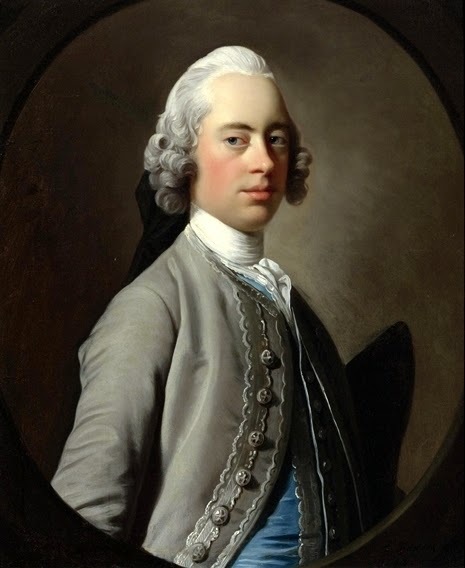 The young Henry’s mother, Diana, married again to Thomas Wetenhall (1708-1776). Betham, William. The Baronetage of England, Or the History of the English Baronets, and Such Baronets of Scotland, as Are of English Families: With Genealogical Tables, and Engravings of Their Armorial Bearings. Vol. 5. London: E. Lloyd, 1805. Google. Web. 12 May 2014. <http://books.google.com.au/books?id=zKNBAAAAcAAJ>. pages 574-5. Sir Henry Mainwaring was educated at Durham School and then at Oxford University. Sir Henry Mainwaring’s portrait was done by Allan Ramsay, a noted portrait painter in 1748 when Mainwaring was about 22. When Mainwaring died leaving no children, this portrait probably passed to his friend George, Lord Grey, later Earl of Stamford. It was sold by the Earl of Stamford’s descendants in 1928. It was recently sold again, by Sothebys in 2007 for £18,000. 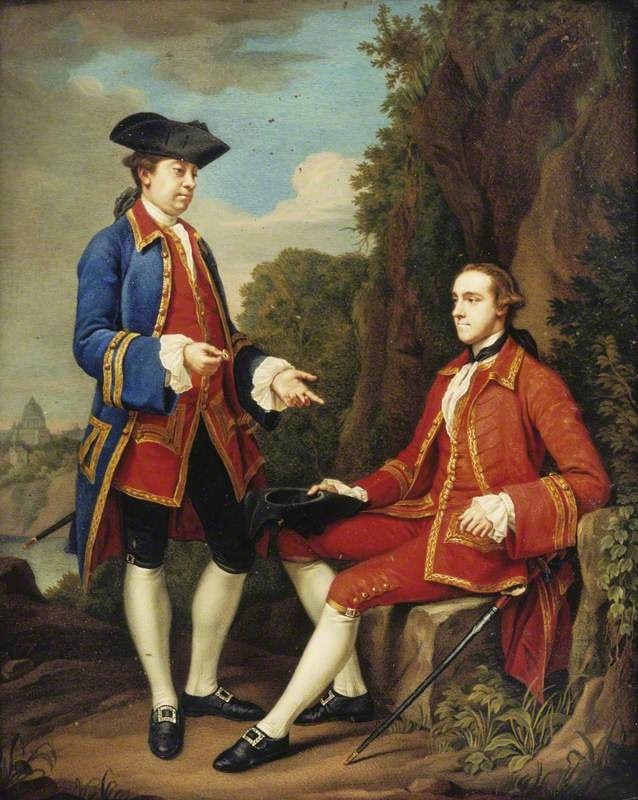 When Sir Henry Mainwaring was in Rome on the Grand Tour in 1760 he was painted with his companion Lord Grey, by Sir Nathaniel Dance-Holland RA. The painting is in the collection of the National Trust and on display at Dunham Massey in Cheshire. Henry Mainwaring, standing, is showing Grey a cameo ring. Grey and Mainwaring commissioned Dance to paint a subject from Virgil. He painted Aeneas and Venus for Mainwaring and The Meeting of Dido and Aeneas for Grey. The latter painting is now in the Tate. 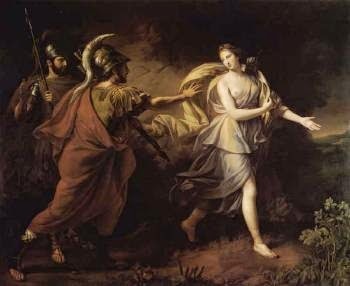 Venus appearing to Aeneas and Achates as a Huntress by Nathaniel Dance dated 1762 was sold by Christie’s in 1994 for £243,500. 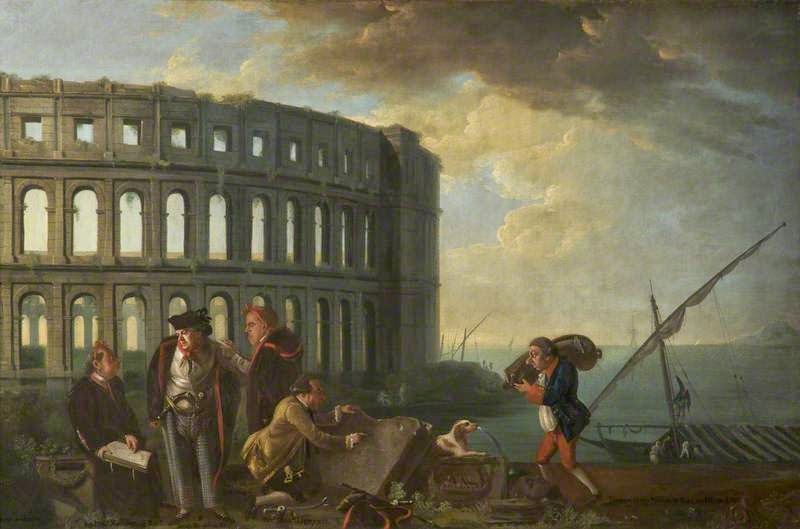 Mainwaring bought other paintings on the tour for example The Bay of Naples from Posillipo by Pietro Fabris and Antiquaries at Pola by Thomas Patch. Antiquaries at Pola: Sir Henry Mainwaring Bt (1726-1797), Jacob Houblon (b.1736), George Harry Grey, 5th Earl of Stamford (1737-1819) and the Reverend Jonan Lipyeatt by Thomas Patch 1760. The painting is at Dunham Massey, now owned by the National Trust following a bequest by the 10th Earl of Stamford. Mainwaring is seated on a Roman altar at the left; beside him Houblon stands, extravagantly dressed in check trousers and red-lined hooded black cloak, a pistol in his belt; and next to him Lord Stamford in a similar cloak; Lipyeatt in the foreground is bending over a marble fragment which he is deciphering. A fragmentary marble head caricatures the features of Patch and his spaniel, with water gushing from his mouth, appears to represent a life-like fountain; a lateen-rigged boat at the right, a servant carrying baggage and in the background the amphitheatre at Pola. Pola or Pula, is opposite Venice on the coast of Croatia. Grey bought A Punch Party in Florence by Thomas Patch which is now owned by the National Trust at Dunham Massey. A Punch Party by Thomas Patch with Sir H. Mainwaring; Earl Cowper; Viscount Torrington; Reverend J. Lipyeatt; Lord Grantham; Sir Brook Bridges, Bt; James Whyte; Jacob Houblon; the Earl of Moray; Mr Charles Hatfield, the landlord; Earl of Stamford; Charles S. Boothby; Sir John Rushout Bt, and Sir Charles Bunbury, Bt. The 5th Earl of Stamford is seen with his friends enjoying an evening at Mr Hadfield’s inn called Carlo’s near Saato Spirito in Florence. The artist has introduced a caricature bust of himself on the wall on the right, with the horns of a faun. Fourteen figures are depicted, engaged in various activities round a table, for example, Lord Grantham is carrying a pedlar’s tray filled with cameos from which Lord Stamford, because he wears it on his finger, has evidently acquired one; but principally they are engaged in drinking the punch provided by the patron Charles Hadfield. On the back wall are paintings of Bacchus and of Silenus in chariots pulled by leopards and tigers respectively; on the wall at the right is a caricature bust of the artist with the ears of a faun, perhaps echoing the replica of the Dancing Faun on the adjacent wall, the original of which is in the Uffizi. The socles on which the sculpture is placed are decorated with the Medici arms. 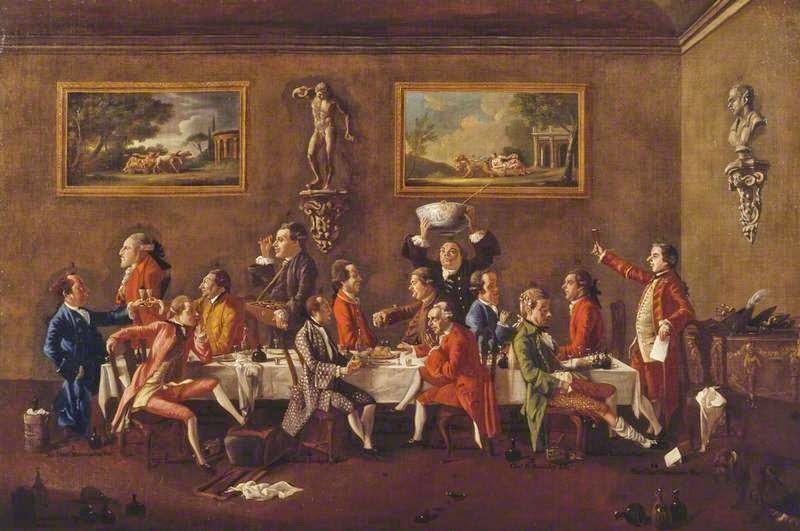 Sir Henry Mainwaring is sitting at the end of the table (in blue) opposite Sir Charles Bunbury who is proposing the toast. Sir Henry Mainwaring the fourth baronet died unmarried and the baronetcy became extinct. 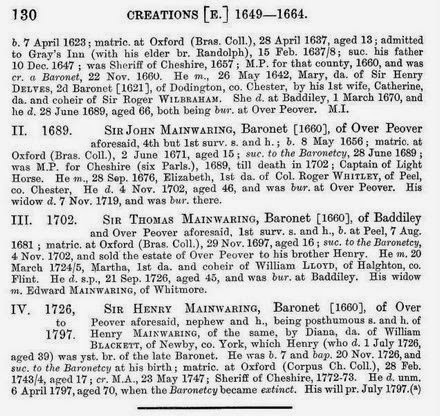 Henry Mainwaring the fourth baronet is my seventh cousin seven times removed.